Three British soldiers have been killed in Afghanistan by so-called friendly fire from American fighter planes, the Ministry of Defence (MoD) has said. The MoD said the soldiers, from 1st Battalion The Royal Anglian Regiment, were killed at around 1830 local time (1500 BST) on Thursday. It is understood they died when the planes dropped a bomb near their patrol in Helmand province. Two other soldiers were also injured. Next of kin have been informed. The fighter planes had been called in to give air support to ground troops, the Ministry of Defence said. Defence Secretary Des Browne said he was "very saddened" by the death of "three brave men who were tragically killed in what is believed to be a friendly fire incident". He said such incidents were "rare" and it would be thoroughly investigated. "We will look at this incident very carefully and make sure the families, who are uppermost in our thoughts, know exactly what happened to their loved ones," he said. He added that US air support was very important and had often helped get British troops out of dangerous situations. "We go to extraordinary lengths to ensure these things don't happen but at the end of the day combat environments are very complex environments. Human error is always a possibility," he said. The US Embassy in London said in a statement: "The United States expresses its deep condolences to the families and loved ones of the soldiers who died, and we wish those who were injured a speedy recovery." The MoD said all the soldiers had been taking part in a fighting patrol to disrupt Taleban activity to the north west of Kajaki, in Helmand province. They came under attack from Taleban insurgents and during the firefight that followed, close air support was called in from two US F15 aircraft, according to the MoD. Lieutenant Colonel Charlie Mayo, a spokesman for British troops in Helmand province told BBC Radio 4's The World at One: "During this patrol they came into contact with some Taleban from a number of firing positions. "As they came under fire they then called in some close air support to assist them and an aircraft came in, it dropped a bomb and tragically this bomb killed three of the soldiers and injured two more." The three soldiers were declared dead at the scene. 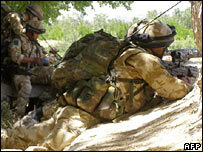 The injured two were evacuated by helicopter to the medical facility at Camp Bastion. Lt Col Mayo said one of the two was very seriously wounded and the other seriously wounded. BBC Kabul correspondent Alastair Leithead said close air support was relied on by ground troops to provide cover, attack the enemy and to get them out of trouble. "In the heat of battle when support is needed very quickly, nine times out of 10 it really does help to get troops out of very difficult positions," he said. Wing Commander Andrew Brookes, a defence analyst, said such air cover must be relied on unless more troops were deployed on the ground. "In this case it was an F15, an awesomely superb ground attack aeroplane but if you don't want that you have to provide enough troops on the ground... such as you don't need to call on the Americans to pull your chestnuts out of the fire," he said. The only other case of British service personnel being killed by in friendly fire involving American military personnel in Afghanistan in still under investigation. An inquiry was launched in December 2006 into the death of marine Jonathan Wigley, 21, killed during an intense battle in Helmand province. In February, Mr Browne told MPs that since 1990, 12 UK service personnel had been killed in friendly fire incidents involving American military personnel in Iraq. The three deaths on Thursday mean the total number of UK troops killed while on operations in Afghanistan since 2001 has risen to 73. Fifty have been killed in action. The Royal Anglians, which have been based at Pirbright in Surrey for about five years, have been one of the regiments hardest hit by the fighting in Afghanistan. There has now been a total of nine soldiers killed from the regiment. It is one of the worst casualty rates since Operation Herrick, the campaign in Afghanistan, began in 2001. On 11 August the regiment's Captain David Hicks was killed during an attack by the Taleban on his patrol base northeast of Sangin in Helmand province. The regimental headquarters of the Royal Anglians is in Bury St Edmunds. The regiment recruits mainly from the counties of Essex, Suffolk, Cambridgeshire and Norfolk.